The first stone and brick church on the current site would have been built soon after the Norman Conquest, although it is possible that there was an earlier wooden Anglo-Saxon church. The nearby Merton Abbey was closed down during the Dissolution of the Monasteries, and the estate sold, being acquired by the Garth family. By the 1630s, the Garths were Puritans, and had the church rebuilt in a more Protestant style, i.e. no places for icons or reservation of bread and wine. The church has a brick outer wall, with a cross on one side of the church and a bell-tower on the other. An English flag often flies from the tower, but was not there on the day I visited. The inside of the church features plain white walls lined with memorials to various notable figures from the parish’s history. One which stands out in particular is a large coat of arms of Queen Anne on the south wall, with the words “Fear God and Honour the Queen” written above it. The church’s website suggests this may have been installed due to Anne establishing the Church Commissioners, who until recently paid Anglican clergy. The windows are stained glass, featuring saints such as Saint Thomas Becket and the eponymous Saint Lawrence. The stained glass windows at the front of the church have inscribed into them the Ten Commandments, together with depictions of Moses and Aaron, and are flanked on one side by a large plaque with the Lord’s Prayer written onto it and on the other side by one with the Apostle’s Creed. An interesting feature is that the ceiling is lined with hatchments, coats of arms of the families of some of the (presumably more well-off) people who had their funerals at the church in the 1700s. As explained on a notice given out with the service sheet, the church is (at time of writing) in an “interregnum” between rectors, with the previous one having recently retired after more than 20 years. The service was therefore taken by (whom I presume was) a layman, who from the front of the church directed the hymns and prayers and gave the sermon. Music for the hymns, and for a piece played before the service while people arrived, was provided by a drummer and a lady on a piano. The congregation was made up of roughly 35 people, filling less than half of the available places in the pews. This would appear to have been less than usual from a comment made by the man who welcomed me – evidently used to seeing more people in attendance – who joked that “they must all be sunbathing” (the weather being particularly hot that day). There was a good variety of different ages and balance between genders, with several people of ethnic minority as well. The service started with a hymn, followed by prayers. After another hymn, there were two Bible readings – Galatians 6:7-16 and Luke 10:1-11 and 16-20 – followed after another hymn by the sermon. The readings were taken from the same books as those at the service at Hackbridge All Saints last month, and the semon was on the same topic of faith and works, leading me to assume that said subject is in Anglican lectionaries for this time of year. The sermon was followed by notices and another hymn, and the service ended with more prayers and a final hymn. The words to hymns were projected onto a slide hanging from the ceiling, and were accompanied by music from a drum kit – some of the congregation even clapped in time to the beat with one of the hymns. This contrasted with the impression given by the sombre memorials and aloof hatchments of the church building to give the service itself a very lively, modern feel. 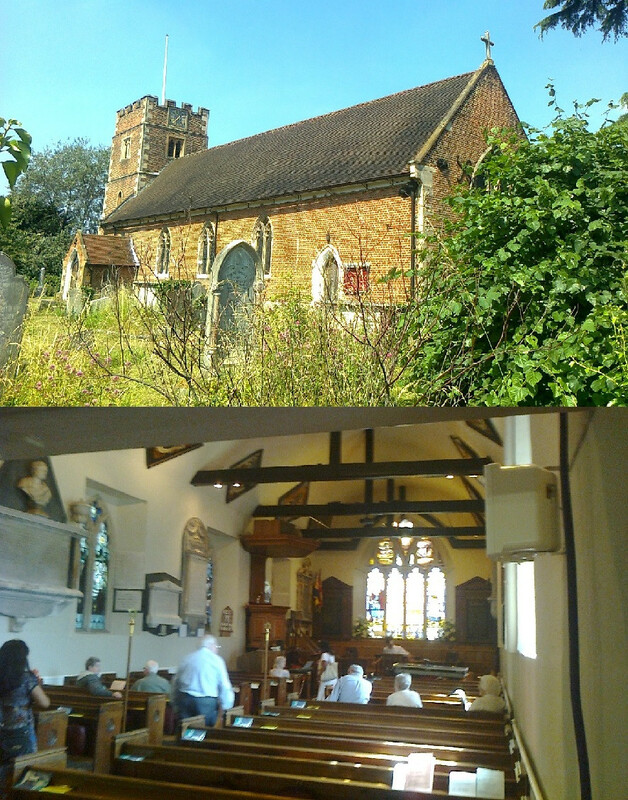 I had to leave soon after the service finished due to prior arrangements, but I saw most of the members of the congregation leave through a door at the back of the church towards a parish hall, where I had been told coffees would be served after the service.